U.S. Opens Tournament Play Tuesday, Dec. 26, Against Denmark in Buffalo, N.Y.
ERIE, PA. — Kailer Yamamoto (Spokane, Wash./Spokane Chiefs) scored the game-winning goal with 6:55 left to play as the United States edged Sweden, 3-1, here at Erie Insurance Arena in its final pre-tournament game ahead of the 2018 International Ice Hockey Federation World Junior Championship. "There was a lot of good things we can draw from this win tonight," said Bob Motzko, head coach of the 2018 U.S. National Junior Team. "If any team expects to go on a run in a tournament like, it's important to have the experience of a tight, competitive game like the one tonight. To come away with a win is huge and something we can build on entering this year's tournament." The U.S. National Junior Team will open play in the 2018 IIHF World Junior Championship next Tuesday (Dec. 26), when it faces Denmark in Buffalo, New York, at KeyBank Center. Puck drop is slated for 8 p.m. ET and will be televised live on NHL Network. Tickets are on sale now here. Casey Mittelstadt (Eden Prairie, Minn./University of Minnesota) opened the scoring 5:51 into the game with a power play tally from the top of the right circle. The play started when Patrick Harper (New Canaan, Conn./Boston Univ.) sent the puck to Quinn Hughes (Orlando, Fla./Univ. of Michigan) who was able to skate to the Swedish blue line, cut back and flick a pass to Mittelstadt that he carried into the offensive zone before tucking a shot under the crossbar for the 1-0 lead. 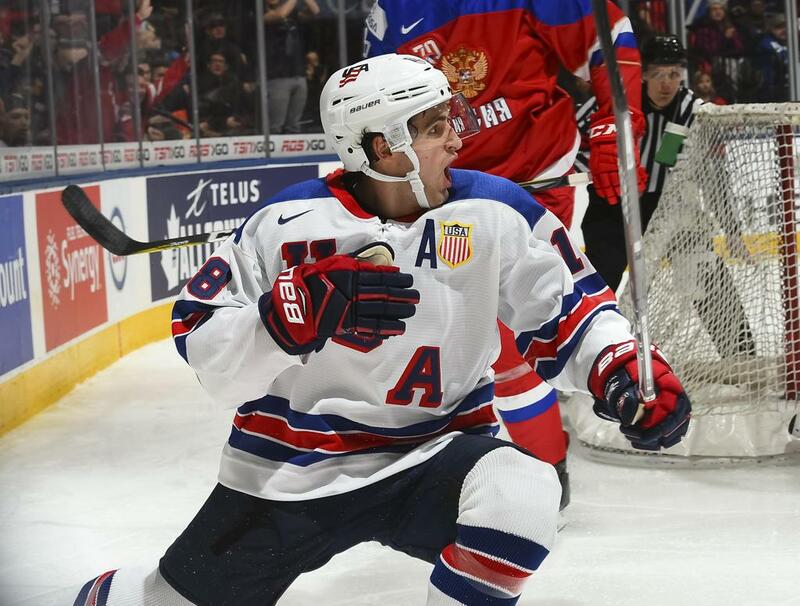 The U.S. nearly doubled its lead twice in the middle of the period with a pair of two-on-one opportunities. After Trent Frederic (St. Louis, Mo./Univ. of Wisconsin) and Max Jones (Rochester, Mich./London Knights) were denied, Harper sprung Mittelstadt and Riley Tufte (Ham Lake, Minn./Univ. of Minnesota Duluth) for an opportunity that was turned aside by Swedish goaltender Filip Gustavsson. With 5:08 remaining in the stanza, Sweden was able to even the score when a long-ranged shot from Jesper Sellgren snuck past a screened Jake Oettinger (Lakeville, Minn./Boston Univ.). The U.S. went on the power play in the final minute of the period but despite a flurry of chances entered the intermission tied, 1-1. Both teams traded chances in the middle frame but neither were able to convert. The best U.S. chance came just three minutes in when Frederic and Yamamoto nearly converted on a two-on-one opportunity. Oettinger was called upon often, including a flurry of side-to-side pad saves, before being relieved at the midway point of the period by Jeremy Swayman (Anchorage, Alaska/Univ. of Maine). The U.S. scored the game-winning goal with 6:55 remaining when Yamamoto converted on the man-advantage. The goal occurred when Mittelstadt's shot from the left circle was redirected to the right of goal where Yamamoto was lift a rebound attempt into the top of the net for Team USA's second power play goal of the game. Frederic scored an empty-net goal with 29 seconds to play to account for the 3-1 final. Oettinger, who started in goal for the U.S., finished with 10 saves on 11 shots while Swayman stopped all eight shots he faced in relief. NOTES: The final 23-player roster, which is expected to be named by Dec. 23, will represent the United States in the 2018 International Ice Hockey Federation World Junior Championship in Buffalo, New York, from Dec. 26, 2017 - Jan. 5, 2018 ... The U.S. will play in the first ever outdoor game in tournament play when it takes on Canada at New Era Field on Dec. 29, 2017. Tickets for that game, as well as all other tournament games, are available here ... Jim Johannson (Colorado Springs, Colo.) is serving as the general manager of Team USA for the eighth consecutive year ... Bob Motzko (St. Cloud, Minn.) is serving as head coach for the 2018 U.S. National Junior Team and joined behind the bench by assistant coaches Greg Brown (Scituate, Mass. 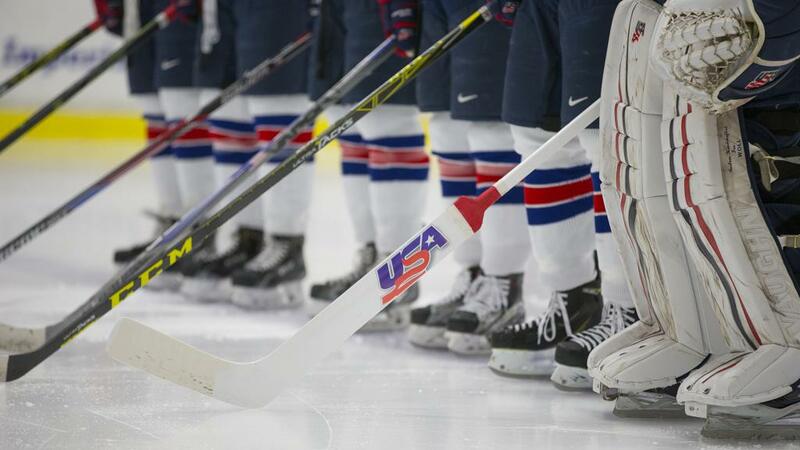 ), Grant Potulny (Grand Forks, N.D.), Kris Mayotte (Pittsburgh, Pa.) and Steve Miller (Littleton, Colo.) ... USA Hockey’s international council, chaired by Gavin Regan (Potsdam, N.Y.), vice president of USA Hockey, has oversight responsibilities for all U.S. national teams ... All U.S. games will be broadcast live on NHL Network.